A team inbox is an organizational space where you can categorize or sort conversations. 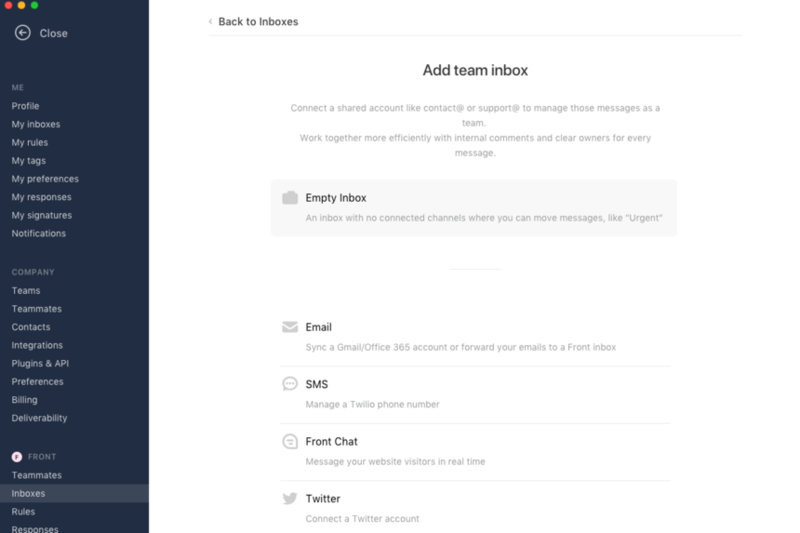 Team inboxes can be created with or without channels in them (Email, Twitter, SMS, etc). For team inboxes without channels, you can create rules that automatically move conversations from other inboxes or your team can manually move messages into them. Name your team inbox. Then click Next. Select the teammates you want to give access to. Then select Create inbox. You should now see the new team inbox in your Team workspace, and can now move conversations to it. On any conversation, click the Move to option and select the team you want to move the conversation to. You can also drag and drop the conversation to the team inbox. Can I reorder folders that are under TEAM INBOXES? I'd like to move recently created folder on top, but I can't find a way to do it. Currently, you cannot reorder inboxes/folders. They are listed alphabetically. One workaround could be to add numbers before the names (i.e. 1-Support). This is on our roadmap, though, so look out for this new feature soon! 1. How can we create subfolders ? 2. How can we create folders that are private to me, and that apear below my private inbox ? 1. Currently, there is no such thing as subfolders in Front. 2. We’ve temporarily removed the ability to create individual folders. There was an issue where conversations that were moved from a shared inbox to an individual folder become private conversations to that user. So, the team that once had access to the conversation, lost access because it now sits in an individual folder. We’ll be releasing a new behavior for individual folders soon, though. Why can't we set up individual inbox folders? Sorry for the delayed reply. We’ve temporarily removed the ability to create individual folders because there's an issue where non-admins can change the access of conversations to private. We’ll release a new behavior for individual folders in later this year. Cori Morris Is there an update on individual folders? I haven't been able to use Front for 100% of my personal emails because of this missing function. Thanks! Is there a way to exclude team folders from the analytics? Any updates concerning individual folders? Joyce Lee Sorry for the delayed response. We are working on individual folders now. Hope to have an update for you soon! Hi Cori , Do you know if this issue was solved? Francisco Mendoza Hi! What issue exactly? Hi, Cori Sorry, I accidentally erased the whole question. I'm talking about the individual inbox folders, Is possible create this inboxes ? Francisco Mendoza Not right now, but we're working on that feature now! We hope to launch it soon. Stay tuned for updates. Cori Morris Perfect, Thank you! @Cori I am new to Front and just now setting up my preferences, etc. I read through this thread regarding folders/subfolders. Has this feature been launched yet, and if so, how do I set my private folders/subfolders up? In my Outlook, I have a lot of folders/subfolders and I won't be able to integrate fully over to Front without having this feature. Cori Morris I am new to Front and just now setting up my preferences, etc. I read through this thread regarding folders/subfolders. Has this feature been launched yet, and if so, how do I set my private folders/subfolders up? In my Outlook, I have a lot of folders/subfolders and I won't be able to integrate fully over to Front without having this feature. Do you have an update on the personal folders? It's been in the works for a long time. No update yet, but it is on our roadmap for this year! I would love to get an update when this is finally available. Niklas Schrimpf I will definitely keep you posted. I am new to Front and configuring the system for the first time. 1. Given that it is not possible to create private folders, is a work around to set up each user with their own team/channel and then to create a team folder for that user's team/channel? If so, do you see any problems with this? 2. I would also appreciate being updated when the feature of being able to create a private folder becomes available.